The Professional Development Visa is a TEMPORARY visa, which enables Australian education and training institutions to sponsor professionals, managers and government officials from overseas who seek to enhance their professional/managerial skills. 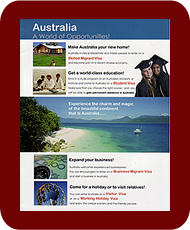 The visa allows you to remain in Australia for up to 18 months and is granted four weeks before you are due to commence a professional development program. Two weeks additional stay in Australia is provided to give you time to finalise your affairs before departing Australia. You cannot lodge a Professional Development Visa application yourself. It can only be lodged by an approved professional development sponsor, i.e. an Australian organisation or government agency which normally would have an agreement with an overseas employer operating outside Australia to provide a professional development program. When approved, the sponsor lodges visa applications on behalf of applicants invited by the overseas employer to participate in the program. If you want more information about this visa, please go to the Department of Immigration and Citizenship’s website for the full and most up-to-date details.